You can align data in cells both horizontally and vertically. Depending on the data you insert inside a cell, Excel aligns it differently. If you enter normal text, then it will be aligned to the left. Any other values, such as numbers or dates will be aligned to the right. If you increase the height of the row, you will notice that by default, data is also aligned to the bottom. In order to change the alignment of the data inside cells in a way you find useful, choose one of the alignments buttons in HOME >> Alignment. The three top icons are used to align data vertically, and the three below them are used to align it horizontally. It gives us nine combinations. 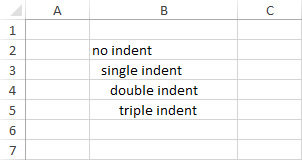 Besides text alignment, Excel also allows you to decrease and increase the text indent. Text indent is used to increase the margin between the text and the left edge of the cell. The icons that are responsible for that are located to the right of the horizontal text alignment icons. Look at the following example. The increase indent button was clicked once in cell B3, twice in B4 and three times in B5.